Don't save pampering yourself until dessert time. 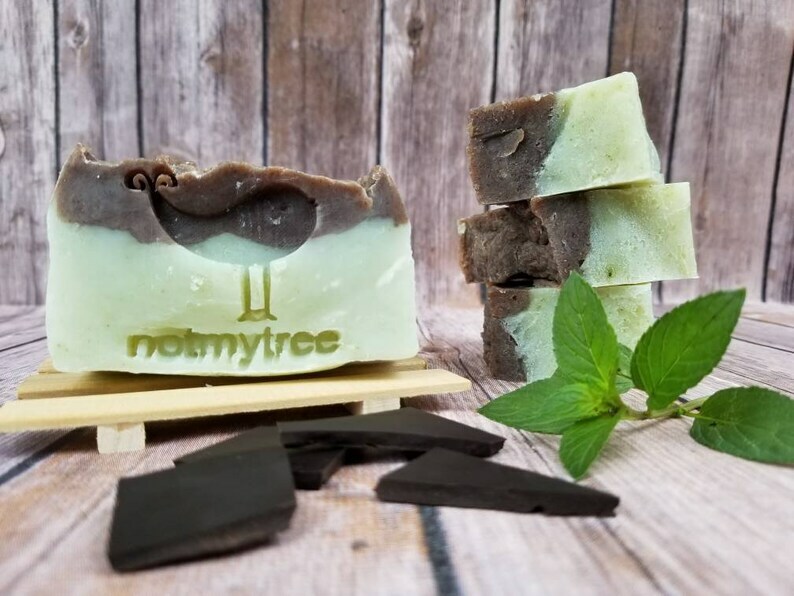 This chocolate covered mint soap is all natural and all decadent. 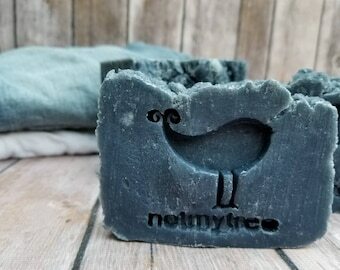 It's colored with organic cacao powder (which also smells divine) and spirulina and scented only with essential oils, so you're getting all of the goodness and none of the ick. Made by me, from scratch, so I know every ingredient that goes into it. 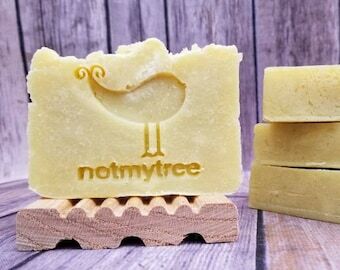 It's perfect for anyone who wants the benefits of a natural, handmade soap without any of the heavy perfumes or artificial dyes that are sometimes found in soap. 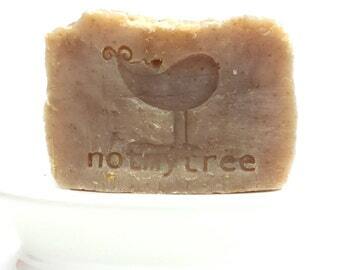 * 100 % natural, vegan ingredients, including coconut oil and olive oil. * Handmade from scratch for a rustic, old-fashioned look. 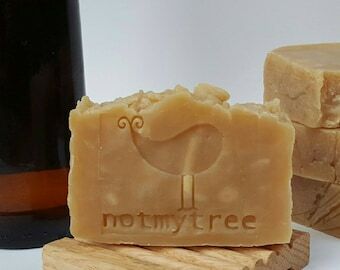 It's not make from a glycerin melt-and-pour base, so it's as natural and real as a handmade soap can get, with no artificial colors or scents. All ingredients are listed clearly on the label, so you (and your gift recipient, if you're giving it away) know what's in it. * Bar weighs between 3.5 and 4 oz., so it's hefty and feels good in your hand. * Creamy lather that makes you feel pampered. Price is for one 3.5 - 4.0 oz. bar of soap. 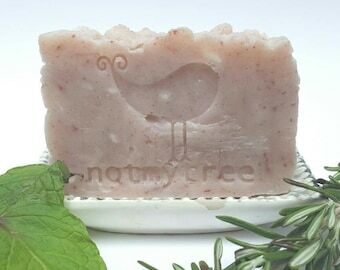 The wooden soap dish shown in pictures #1 and #8 can be added to your order as an option for an additional $2.50. It is designed to offer maximum drainage so that your soap can stay dry between uses, which will make it last longer. 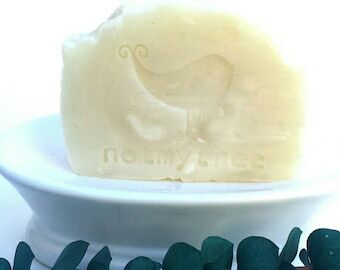 Wrapped up with a bar of handmade soap, it makes a great gift. ♥ Please contact me with any questions. ♥ If you like this but aren't done checking out all of the cool things on Etsy that will add charm to your life, please click on the heart button to your right that says "Favorite" to remember it later. ♥ Or you can buy it now by clicking on the "Add to Cart" button! Fabulous! Gently fragrant and quite soothing. 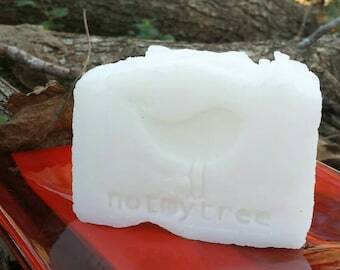 Very nice soap, thank you. Do you have any current coupon codes, discounts or sales? Current sales, discounts and coupon codes are always listed at the beginning of my shop announcement. They change frequently and are often seasonal, so please check back often! 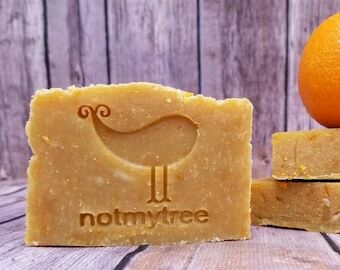 What do you mean when you say your soaps are natural? 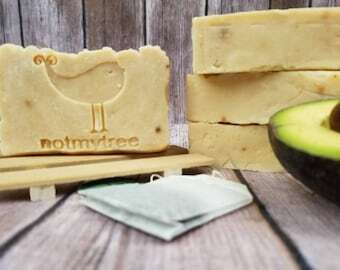 The base ingredients of my soaps are all-natural: oils you can find on almost any grocery store shelf. Colorants are all natural elements that can be found in nature. By customer demand, I have recently began using fragrance oils in some of my products in order to produce more sought-after scents that cannot be derived from essential oils, and these are listed clearly in my ingredient label on each bar. There are no hidden ingredients. If you have any questions, I'd be more than happy to answer them!